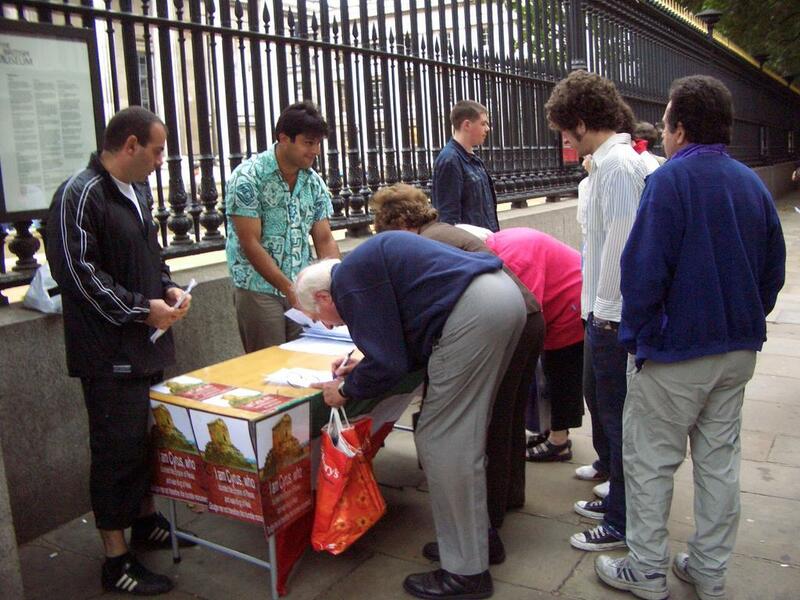 We were outside the British Museum again today from 12 o'clock onwards, collecting signatures to stop the building of the Sivand dam, which will endanger the historic sites around Pasargard. Total number of signatures we have now collected is more than a 1000, signed by people of all professions and all nationalities. Today we also had more volunteers and I had a chance to view the exhibition myself. 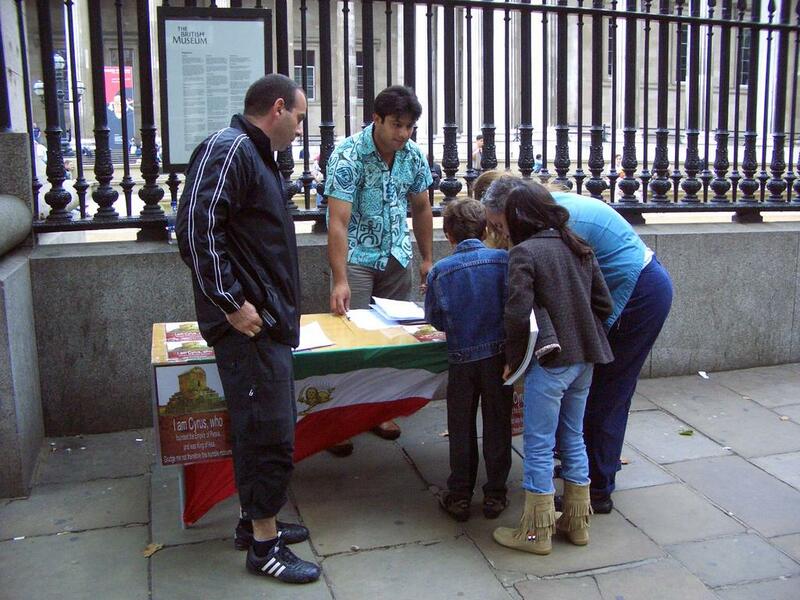 I must congratulate the British Museum, they really have put on a magnificent display of Persian Empire's artifacts. It is amazing how some of the items have remained in such good condition. One item that really grabbed my attention was a Darik coin. On the coin there was a sun and lion engraving and a crescent underneath the lion. Clearly demonstrating the ancient origins of our Sun and Lion national emblem. The exhibition also showed parts of the Persepolis reconstruction DVD. What overwhelming splendour, how daunting it must have been for anyone visiting the Persian court at that time. I can not now go to Persepolis, but thanks to the exhibition, parts of Persepolis came to me. These were not ordinary artifacts, they were fragments of my identity and the making of my forefathers. The bond felt so strong. I felt so proud, I was enjoying the pleasure non-Iranians were visibly displaying from watching the items and inside I was gleaming and saying, "yes this treasure belongs to me, you are welcome to share it with me." Its hard to describe it in words, it was breath taking, and I had to fight hard to keep back the tears when the DVD reconstructed the burning of Persepolis. A moment of madness in history, enflaming all that artistry and splendour. Watching Persepolis burn in flames made what we were doing outside the Museum even more significant. No more madness, we must preserve the heritage of our forefathers. We must make Cyrus feel proud of his children again. When I came back outside, the chaps were collecting the signature of a young German guy who had visited Persepolis and Pasargard only two months ago. As he was signing the petition, he told us in his German accent "I must congratulate you Persians for your wonderful culture". What a day, goose bumps and pride all the way round. As the day drew to a close, I whispered to myself looking at our poster of Cyrus' tomb "Rest well Cyrus, your sons and daughters all around the world will make you proud"
The good children of Cyrus. Saving the heritage for posterity. 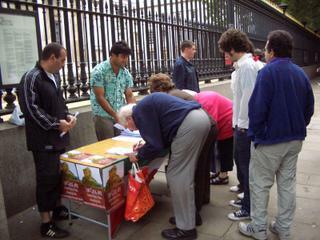 Children signing the petition alongside their parents. This is Akbar Nemati, an Iranian citizen, here in Iran Also we'r so worry about Sivand Dam. I've a website titled dusharm (www.dusharm.com) and write about our culture there. I'll be in London during Sep, 29 - 1 Oct for World of Achaemenid Empire Conference. I'll really pleased to meet you there. 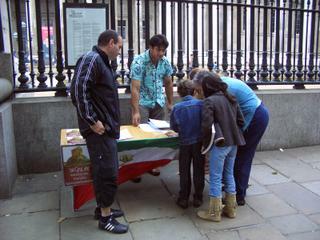 Many thanks to friends of Persia who are standing in front of British museum and are collecting signatures to save our national heritage. please continue to support the sivand dam dustan. Lets do this together and support our heritage with honours of being an iranian(persian) citizen and may our country rise on top with your help. I just came from your blog. It was very interesting and well written.